Casita has a charming Southwest decor, including hand-made Mexican tile kitchen counters, southwestern decorations, hardwood floors, weathered doors on the bedrooms, and multi-level layout. With 2 bedrooms, (one King and one Queen), and a twin sleeper sofa, it sleeps a total of 5. 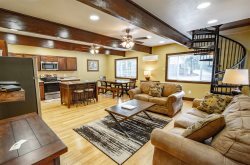 2 bathrooms – one with a Jacuzzi Tub, front and rear patios, vaulted ceilings and ceiling fans in the spacious living area, a full kitchen with everything to cook the perfect meal. You will find this cabin-suite charming and inviting as a get-away for a family or two couples. Just out your door is the courtyard, where you'll find gas grills, a horseshoe pit and the hot tub, with lots of seating for hanging outdoors with family and friends. Across the driveway is the Main Lodge, where you'll find the pool table and a very spacious, comfortable living area with beautiful flagstone fireplace.